Another visit to Barter Books in Alnwick means I’ve added 5 more books to my TBRs. Fair Stood the Wind for France by H E Bates – a Penguin modern classic. It was first published in 1944 and is about a British pilot, John Franklin, whose plane was shot down in occupied France, and Francoise, the daughter of a French farmer who hid Franklin and his crew from the Germans. I haven’t read any other books by Bates (1905 – 1974) – he was a prolific writer. Recalled to Life by Reginald Hill, the 13th Dalziel and Pascoe book. Dalziel reopens the investigation into a murder that took place in 1963 – the year of the Profumo Scandal, the Great Train Robbery and the Kennedy Assassination. I should be on safe ground with this book as I’ve enjoyed all the other Dalziel and Pascoe books I’ve read. Mystic River by Dennis Lehane. Three boys’ lives were changed for ever when one of them got into a stranger’s car and something terrible happened. Twenty five years later they have to face the nightmares of their past. I’m not sure what to expect from this book, not having read any of Lehane’s books before, but a reviewer in the Guardian described it as one of the finest novels he’d read in ages. The Hog’s Back Mystery by Freeman Willis Crofts, first published in 1933 during the Golden Age of detective fiction between the two world wars. It’s an Inspector French murder mystery set in Surrey, where first one person then others disappear. Have they been murdered? I’ve read just one of Crofts’ books before, Mystery in the Channel, which completely baffled me – will this be just as complicated? The Virgin Blue by Tracy Chevalier, the story of two women, born centuries apart and the ancestral legacy that binds them. This was Tracy Chevalier’s first novel. I’ve read and enjoyed some of her later books, including The Girl with a Pearl Earring and Falling Angels, so I’m looking forward to reading this book. Please let me know if you’ve read any of these books and whether you enjoyed them – or not. 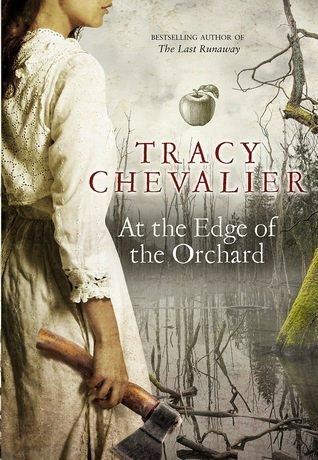 I’ve been reading some good books this year and At the Edge of the Orchard by Tracy Chevalier is no exception, which is no surprise to me as I’ve enjoyed all of her books that I’ve read so far. This is historical fiction, a mix of fact and fiction. Most of the places are real (and there is a helpful map at the beginning of the book) and some of the characters are historical figures. There is a lot of information about trees – apple trees, redwoods and sequoias, all of which fascinated me (especially the sequoias) and formed integral parts of the book. It’s the story of the Goodenough family, James and his wife Sadie and their five surviving children. It begins in 1838 in Black Swamp, Ohio where James and Sadie are arguing over apples and practically everything else. James is obsessed with apples and prefers the sweet variety, the eaters , whilst Sadie loves the ‘spitters’, the bitter apples to make cider and even better, applejack. Theirs is a marriage of opposites. They had settled in the only land available – the swamp and had struggled first of all to clear the land and plant the apple seedlings and seed they had brought with them from Connecticut. Their story alternates between James’ perspective and Sadie’s – their voices clearly distinctive and recognisable. Sadie is bitter and vindictive, picking fights wherever she can and their family life is terrible. James, although he loves his children is unable to show his feelings and Sadie moves between extremes, is unpredictable, at times loving but more often vicious and cruel to them or simply indifferent. She constantly taunts James, and their relationship going from bad to worse. Of all the children Robert is the one who shows an interest in the apple trees. In the second part of the book the focus is on Robert, the youngest son who leaves Black Swamp after an incident that is only revealed later in the book. He went west, working where he could including a stint as a gold miner in California, until he reached the ocean ending up in San Francisco where he worked for William Lobb (a real historical figure), collecting seeds and seedlings to send to England. His story is told through the unanswered letters he sent to the family over seventeen years. The characters are wonderful, from the dysfunctional Goodenough family, to Molly, the strong, independent and resourceful woman Robert meets during the time he worked as a gold miner. I also liked Martha, Robert’s younger sister, who shows determination and spirit despite the heart-breaking situations she has to live through. I loved the settings, and would love to visit places described such as Calaveras Grove and South Grove to see the giant redwoods and sequoias for myself, but I doubt very much that I will ever be able to see them. In the Acknowledgements Tracy Chevalier refers to a place nearer to home that I could visit. It is in Wales – the Charles Ackers Redwood Grove which was planted in 1857 by John Naylor of Leighton Hall. The one criticism I have is the ending. I came to the last page and thought ‘is that it?’ – I wanted to know more. I hope there will be a sequel. My thanks to the publishers and NetGalley for my copy of this book for review. 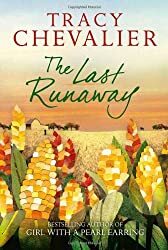 The Last Runaway by Tracy Chevalier – I really liked this book, historical fiction about the life of Honor Bright after she emigrated from Dorset to America in 1850 where she joined a Quaker community in Ohio. It intertwines her story with that of the ‘Underground Railroad’, helping the runaway slaves from the southern states to escape to Canada. Honor is a quilter, but finds that American quilts are not the same as English ones, just as America is very different from England, both in landscape, temperature and culture. She struggles to fit in, finding it hard to adjust. I thought this was well handled and the sense of period and place is impressive, with a wealth of detail about the land and the struggles of the settlers. She can’t face the journey back across the Atlantic and marries Jack Haymaker, a young farmer whose mother and sister disapprove of her. The slavery question caused Honor a real dilemma, as she became involved in the Underground Railroad, a network of safe houses and people willing to provide food and shelter for the runaways. Should she abide by the law, or follow her Quaker beliefs about equality, thus putting the rest of her family at risk as well as herself? This is compounded by her relationship with Belle Mills and her disreputable brother Donovan who has taken a liking to Honor, but is also a slave-catcher, ruthless in his pursuit. In complete contrast I moved on from The Last Runaway to Wycliffe and the Four Jacks by W J Burley, crime fiction set in Cornwall, featuring Chief Superintendent Wycliffe, who is on holiday but still gets drawn into a murder investigation. Author David Cleeve, who writes under the pseudonym Peter Stride asks for Wycliffe’s advice about a series of sinister warnings he has received in the form of a playing card – the Jack of Diamonds. Then, a young woman is found dead, an apparently motiveless crime, but, as Wycliffe discovers, it follows a series of crimes, the clues all seeming to centre on an archaeological dig on Cleeve’s land. A further murder helps to pinpoint the culprit. It’s periods like this, however, that help Wycliffe focus his thoughts. 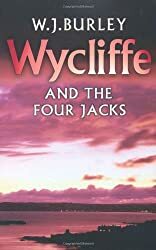 Wycliffe and the Four Jacks was first published in 1985. It’s the 12th in Burley’s series of 22 Wycliffe books. I really enjoyed reading Falling Angels by Tracy Chevalier. It’s been sitting unread for several years on the to-be read shelves and I’ve been meaning to read it for ages after reading her earlier book, Girl with a Pearl Earring. I should have got round to it sooner. I woke this morning with a stranger in my bed. The head of blond hair beside me was decidedly not my husband’s. I did not know whether to be shocked or amused. Well, I thought, here’s a novel way to begin the new century. It is 1901, the day after Queen Victoria’s death and the ‘I’ in this opening is Kitty Coleman, one of several narrators in this novel set in Edwardian England. Two families visit neighboring graves in a fashionable London cemetery. One is decorated with a sentimental angel, the other an elaborate urn. The Waterhouses revere the late Queen and cling to Victorian traditions; the Colemans look forward to a more modern society. To their mutual distaste, the families are inextricably linked when their daughters become friends behind the tombstones. And worse, befriend the gravedigger’s son. As the girls grow up and the new century finds its feet, as cars replace horses and electricity outshines gas lighting, Britain emerges from the shadows of oppressive Victorian values to a golden Edwardian summer. It is then that the beautiful, frustrated Mrs Coleman makes a bid for greater personal freedom, with disastrous consequences, and the lives of the Colemans and the Waterhouses are changed forever. A poignant tale of two families brought reluctantly together, Falling Angels is an intimate story of childhood friendships, sexual awakening and human frailty. Yet its epic sweep takes in the changing of a nation, the fight for women’s suffrage and the questioning of steadfast beliefs. Maybe my great aunt who never married and became a matron at a public school would have had more sympathy and agreed with the suffragettes that all women would not get the vote all at once and they had to start somewhere. These are the early years of the suffragette movement culminating in the book in June 1908 with the Women’s March in Hyde Park to demand Votes for Women. I liked the multiple first person narrator structure of the book, giving an all round view of events and the characters’ views and thoughts. It was easy to distinguish between them all, the two daughters, Maude Coleman and Lavinia Waterhouse in particular are very well depicted. The setting too is so well described that I could imagine myself wandering round the cemetery with all its gothic symbology, and see the suffragettes’ march with their banners ‘Deeds not Words’ and hear their cries of ‘Votes for Women’. It’s an easy to read book that still manages to contain depth both of characterisation and of themes – family relationships, in particular that of mother and daughter, attitudes towards death and mourning, the change in social codes, the perils of being an unmarried mother and the beginnings of the women’s movement. I was fascinated by it! This page on Tracy Chevalier’s website lists her books – I have one more of hers – The Lady and the Unicorn, I mustn’t wait too long before I read it! Although I didn’t read this to take part in any challenges I realise that it fits in with several I’ve signed up to do – the Mount TBR Challenge, the Historical Fiction Reading Challenge and the What’s in a Name Challenge (in the category of book with the word ‘down’ or an equivalent in the title).